In a book group? A women’s group? Do you teach middle school or high school or teach in a graduate program in Women’s Studies, American History, or another relevant topic? These questions are sure to spark fascinating discussions. Chapter 1 introduces the 1910s as the Progressive Era. Horse-drawn carriages and wagons travel unpaved streets and schools are mostly one-room buildings. Education ends at eighth grade for 65 percent of the population and there are no child labor laws to protect children from long hours in factories and sweatshops. What is so progressive about this decade? Which girls’ stories in this chapter show signs of that progress? “Car culture” revs into full gear in the 1920s at the same time there are new forms of entertainment and inventions that dramatically change life at home. What are some of those developments? How do they affect a girl’s daily life? In Chapter 3 “the Lost and Found Days” are described as the Depression makes its mark. What are some signs of “Found Days” in the 1930s stories? World War II takes its toll on American culture in the first half of the 1940s. 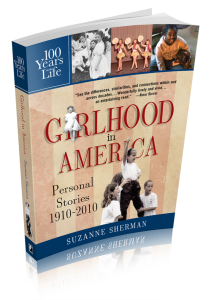 How are girls’ lives different before and after 1945? The 1950s glamorize the lives of housewives on the new TV commercials, where consumerism is promoted like never before. In Chapter 5, how is a mother’s life at home different now? How are the girls affected as a result? Cultural change takes America by storm in the 1960s. Which of the girls’ stories in Chapter 6 illustrate this? What are some positive outcomes for the girls? The 1970s bring greater freedom of choice for women. What are some of those new freedoms and how do they influence the young girls in Chapter 7? “Tweens” have a new role in American culture in the 1980s. Clothing styles, music and video games are targeted to young girls like never before. How do the stories in Chapter 8 describe this budding phenomenon? The Digital Age is flourishing in the 1990s. What are the new concerns and involvements and how do they seem to influence girls’ evolving culture? Chapter 10 opens the 21st century, with girls describing life in four regions of the United States. These storytellers were born between 1990 and 2001, which means they are not only the youngest storytellers in the book but they are still in childhood or are closer to it. What do you notice about their interests and views on life? Do the telephone, radio, record player (phonograph) and movies divide or unite families in the 1920s? How does that change over the next few decades? What do the girls have in common through all of the chapters? At some point in the 20th century, girls become aware there’s a world beyond their family and neighborhood. When and why does that awareness begin to happen? How does it change in the Digital Age (after 1980)? In what decade did a young girl’s culture begin? How would you describe that culture? What are a few of its influences? What stands out about the girls when you contrast the first and last stories in the book?